An 18-hole championship golf course a luxurious spa and a top-shelf dining experience make the Rancho Bernardo Inn a favorite. Built in 1963 this three-story hotel with Southern California and Spanish-style architecture has 287 rooms beautiful fountains and lush gardens on 265 acres. Relax on a private balcony or patio with views of the golf course the valley or the beautifully manicured gardens. Doze off on upgraded bedding in front of the 42-inch flat-panel TV. Maintain your professional standing with free Wi-Fi and a large workspace. Sail away in a deep soaking tub with high-end bath amenities. Rooms also include DVD/CD players and iPod docking stations. Swing like a pro at the 18-hole championship golf course or melt away with a soothing massage in the spa with treatment casitas and 2500-square-foot spa pool. Kick it with cardio and crunches in the fitness center. Make a meeting at the 27000 square-foot conference center. The hotel's signature restaurant serves fresh seasonal flavors and artisan libations while enjoying tunes from local artists. There's also another restaurant with outdoor seating and views of the golf course that's open for brunch lunch and dinner. Parking is available for an extra charge. 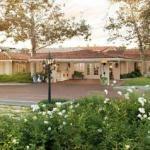 The Rancho Bernardo Inn is two miles from I-15 making access to the San Diego area easy for guests. Wine lovers are just three miles from the Bernardo Winery a local favorite and for beer fans San Diego is home to more than 100 local and craft breweries including the famous Stone Brewery an 18-minute drive from the hotel. Petco Park home of the San Diego Padres is a 30-minute drive. Famous local attractions are nearby: the Safari park is nine miles north of the hotel and the world-famous San Diego Zoo is also nearby. The hotel is 27 miles from San Diego International Airport.